Apple are a natural source of flavonoids. Studies shows who individuals who regularly consume fruits and vegetables high in this phytochemical enjoy healthy lungs. Apples, specifically red apples contain a powerful antioxidant called quercetin. Discover how this simple compound can help to boost your system. 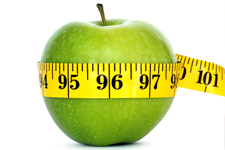 Enjoy a slimmer weight when you eat more apples. The reason is the fiber. Did you know foods that are high in fiber help to fill you up faster and feel fuller longer. Did you know apples are the second most popular fruit in the United States? The most popular fruit for Americans is a banana. The average American eats about 19 pounds of apples per year and with the average apples weighting .33 of a pound, the Americans eat almost five dozen apples per year. What makes the apple so convenient is they are available year round. No matter the time of year, you can always find apples in your local grocery store or at a local farmers market. Best of all, apples are packed with a number of condition-specific health benefits. Compared to other commonly eaten fruits, apples ranks as the second highest for total antioxidant capacity. However, they rank #1 for the highest proportion of phenolic compounds. In other words, the naturally occurring phenols are more easily absorbed into your bloodstream. The secret behind the natural health benefits of apples is the peel or the skin. Similar to other fruit skins that you consume, the peel of the apple contains the majority of the benefits of the apple. The reason the skin is so beneficial is that is what keeps the pulp and juice of the fruit protected from everything Mother Nature can throw at it. Apple consumption has also been associated with a decreased risk of coronary heart disease… [and] a reduced risk of Type II diabetes was associated with apple and berry consumption in another major Finnish study. In the laboratory, apples and the compounds in them have properties that may explain their effects in protecting against disease. Our lab has found that apples, and especially apple peels, have powerful antioxidant activity and can greatly inhibit the growth of liver cancer and colon cancer cells. Also, make sure not to miss out on the informative videos on the health benefits of apples below, too. One medium-sized apple, these are typically the size of an apple found at your local grocery store or farmers market, contains about four grams of fiber. The fiber found in apples also contain a special form of pectin. Pectin is a soluble fiber that helps to lower the “bad” cholesterol. The reason is helps to lower the LDL or bad cholesterol is it actually helps to block the body’s ability to absorb cholesterol. This is called satiety. Satiety is when you enjoy the feeling of being fuller longer after you eat certain foods. Apples deliver a powerful combination of fiber that requires more time for our body to digest when compared to refined grains or sugar, for example. According to nutrioniest, the average person should consume about 25 – 40 grams of complex fiber per day. Health magazine reported a study which reported, participants eating five or more apples a week enjoyed better lung function. According to the study, an antioxidant, naturally found in apples called quercetin was most likely the reason for the postive effect on the lungs. Quercetin is found in the skin of the apple. In addition, another study found that women who enjoy plenty of fruit in their diet are less likely to have children with asthma. A medium sized apple delivers over 8 milligrams of immune-system-boosting vitamin C. If you aren’t able to enjoy an orange for your Vitamin C intake, grabbing an apple is an excellent choice. The skin of the apple contains most of the fiber of this tasty fruit. The component called ursolic acid helps to increase your body to burn more calories. The American Journal of Clinical Nutrition, published a study that found apples, and other fruits including pears, were linked to individuals with a lower risk of developing type 2 diabetes. The reason is the presance of anthocyanins. This powerful class of antioxidants is responsible for giving fruit and vegetables their multiple colors. 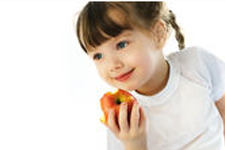 Crunchy foods like apples, carrots and peppers act like natural tooth brushes. 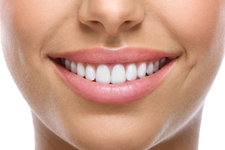 The reason is when you chew the food, the tuff skins and pulp helps to scrub your teeth and remove stains naturally. This is especially true if you are a coffee drinker. Over time, coffee begins to stain your teeth, but if you make it a habit to enjoy an apple shortly after your morning cup of coffee, you’ll soon enjoy a whiter smile.